It’s that time of year again when the adverts have begun telling you to get ready for the big parties, your colleagues are asking you if you’ve started your Christmas shopping yet and there’s a looming feeling of panic setting in and a small voice inside telling you to ‘buy, buy, buy!’ I know several people, especially women, who have the same feeling of ‘seasonal panic’ and it’s strongly linked with the myth that we must spend more to be happy. One such event that capitalises on this feeling is Black Friday, the day after the US holiday of Thanksgiving, regarded as the first day of the Christmas shopping season, on which retailers make many special offers. We’ve seen scenes of huge crowds climbing over each other to grab the cheapest TV or Xbox, and we tell ourselves that we’re not that bad, but how many of us can say we haven’t been tempted by those flashing ‘SALE’ signs? UK consumers are expected to spend almost £5bn on Black Friday this year, with half of this likely to be spent online. This year, why don’t we try doing things differently, slow things down and avoid the pressures to overspend? 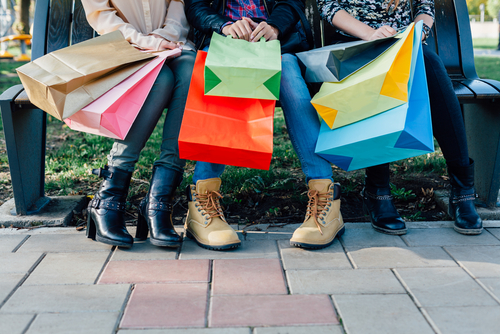 As we’re becoming more aware of how our purchasing habits are affecting not only the environment, but also our own mental health and wellbeing, it’s important to know there are alternatives out there and there is a growing resistance to the traditional consumer mentality. More and more people are looking at what they buy (and why), and are seeking out products based on their sustainability and longevity. Support Small Business Saturday, a grassroots campaign that highlights small business success and encourages consumers to ‘shop local’ on the 1st December and support small businesses in their communities. This is a great way to still enjoy buying gifts for loved ones, whilst supporting small businesses and independent retailers instead of the big brands. Why not check out your nearest Etsy market or local craft fair happening that day, these are the perfect place to pick up homemade, personal gifts that support creative tradespeople. Research your brands. It’s important to know where your money is going and to know if the brand you’re supporting is aligned with your personal ethics and moral compass. All too often we focus on the product itself and not the company behind it. This year, why not research an organisation that is supporting causes that you believe in, and make some of your purchases from them? A great example is the outdoor clothing company Patagonia, who in 2016 announced a week before Black Friday that 100% of their sales from the day would go to charity. They raised over $10 million that day and, as promised, distributed the funds to several environmental charities and small, grassroots non-profits that have the opportunity to make a local impact. Green Friday is the idea of getting outdoors on the 23rd November, instead of traipsing around crowded shops or cooped up at your laptop hunting for deals online. It’s a great way to reconnect with nature and can help you de-stress in the lead up to Christmas, something a lot of us may need! Invite your friends or family to join you and enjoy a day of having fun and being out in nature. Stop, question and decide. Practice the habit of stopping before you purchase, asking yourself why you want this and then decide based on your ethical principles. Slowing down the gift buying process can help you make more informed decisions and lead to more heart-felt presents for your loved ones. This year, let’s put our health and happiness before getting a good deal and put our purchasing power to good use. We can all be conscious consumers and still enjoy the feeling of giving this season.